Carnival Freedom marks some significant changes in Carnival Cruise Line’s approach to family cruising. Freedom was built in 2007, but a dry dock in spring 2014 brought with it a number of Fun Ship 2.0 amenities and family firsts. Freedom is the first ship in the fleet to feature Camp Ocean, replacing Camp Carnival fleetwide as the onboard children’s program, as well as the first ship to feature the full Seuss at Sea program. Carnival Freedom sails a number of different itineraries in the Caribbean, from Fort Lauderdale and Galveston, and with new bars and venues for the adults and refreshed programs for kids and families, the ship provides an all-ages atmosphere, ushering in everyone from couples to multigenerational groups. There are no family-style cabins onboard Freedom, but roughly 194 connecting cabins offer more space, across various categories and cabin decks. Cabin categories on Freedom include Interior, Ocean View (with glass wall, balcony or no balcony), Suite and Penthouse Suite. The cabins with a glass wall offer an ocean view and parents won’t worry about the kids exploring the edges of the balcony. There are 28 accessible cabins onboard Carnival Freedom. The cabin color scheme remains fairly consistent fleetwide, with a predominating palette of burnt oranges carried by the upholstery, carpet, bedspread and curtains, offset by cream-colored wall panels. Cabinetry, end tables, moldings and other accents are natural-finished wood. A fair number of cabins with twin beds can’t be combined into a single king bed, so make sure you know your preferred setup when booking. The only bathtubs onboard are in suites, so if that is a necessity, expect to shell out a bit more. All cabins feature plush terry robes and a bowl of assorted toiletries and amenities in the bathroom. Hairdryers are standard in every cabin. Shampoo and body wash dispensers are in the shower stall, so bring conditioner if you use it regularly. There’s plenty of shelving above the sink, but hardly any to fit travel-size bath products from home in the shower. A swing-out magnifying makeup and shaving mirror is located near the sink. All cabins include TV’s with satellite feeds of the major networks and cable movies, and a host of infomercial-style offerings hyping what’s available on the ship. One channel is devoted to broadcasting events in the Victoriana Lounge, and interactive choices include onboard account review and shore excursion descriptions and booking. Each stateroom also has a safe and mini-fridge, stocked with a selection of beer, wine, water, juices, soft drinks and alcoholic beverages, as well as snacks, priced a la carte. Cabin stewards check the fridge once or twice during the cruise and refill as needed. Storage space is plentiful with ample drawers, closet space, hangers and even some nooks and crannies in bedside tables to store everything you need. A caveat is there’s only one electrical outlet. That means in a cabin full of family members with phones, cameras, laptops and iPads, only one is getting plugged in at a time; it’s a constant rotation to make sure all the gadgets are fully charged. 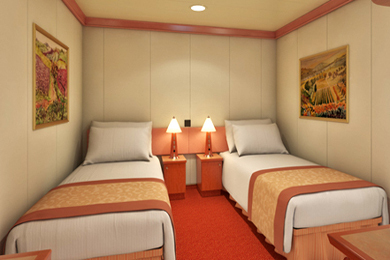 Carnival’s Interior cabins are spacious, with the minimum size (of standard inside staterooms) of 185 square feet. There are 570 inside cabins in a variety of room configurations, but fitting a family inside poses a challenge. There are 361 Ocean View cabins onboard (without a balcony). Of these, 18 feature a glass wall; these cabins measure 230 square feet and are located on Deck 11, the Spa Deck (close to Camp Ocean and Bookville, located on Deck 12). Six Category 5A standard outside staterooms have portholes rather than windows, and a number of Category 6B outside cabins have obstructed views, so look before you book. The glass wall cabins offer the best views without risking a door to the outdoors for small, curious cruisers. Sixty percent of standard outside cabins have balconies (504 to be exact), though the smallest balcony, at 35 square feet, leaves little room for sunning or dining. The remaining square footage is 150 on the interior (185 square feet total). Some cabins have extended balconies at 60 feet or wraparounds at 75 feet. A standard balcony features two fabric blue deck chairs (one upright, the other reclining) and a small table. Mom and dad sitting out and sipping wine is more than accommodated, but a full recline in the chair for a teen seeking some private sunbathing, requires a bit of maneuvering. There are 42 suites onboard. Suites are 350 square feet and include the all-important bathtubs. All Suite (and Penthouse) passengers receive the spa’s Elemis-brand bath products and VIP check-in, but little else. There are 10 Penthouse Suites available on Freedom. At 430 square feet (345 in cabin, 85 on the balcony), some penthouses add a dressing room with vanity and walk-in closet (for families requiring excess storage). Located on Deck 9, the cabin hallways feature fun wallpaper vistas of the beach and distinct, light wooden doors. Freedom does a great job of balancing activities for adults, kids and families. The first ship in the Carnival fleet to receive Camp Ocean facilities, as well as the full Seuss at Sea program, Freedom is not only outfitted to keep children of any age content, but also offers activities suited for family participation. Seuss at Sea includes a number of activities during your cruise, as well as the permanent onboard reading space, Dr. Seuss’ Bookville. Bookville, located to the right of Camp Ocean on Deck 12, is open to passengers of any age. Colorful, funky-shaped couches and cushions and bright multicolored chairs invite you to sit and relive the nostalgia of parenthood, childhood, or to hear a Dr. Seuss story for the first time. Held on the first sea day of our sailing (at about 3:30 p.m.), Seuss-a-Palooza is a parade for all ages, beginning in the International Lounge on Deck 5, where you should arrive early to snag props, such as characters on a stick, red-and-white pom-poms and storybook banners. Counselors are present to instruct kids and adults alike in the chant, the march and to stir general excitement. One by one, Seuss’ characters — Thing 1, Thing 2, Sam I Am and Cat in the Hat — make an appearance, followed by your cruise director, who will lead the parade through the halls and down the stairs, ending in the Victoriana Lounge on Deck 3. The parade culminates in Story Time, an interactive reading of “The Cat in the Hat” that takes place on the Victoriana Show Lounge stage. Children are encouraged to gather on the stage, and parents are encouraged to participate in the reading as well. Seuss-a-Palooza is an hour well spent with the family. A photo opportunity is held in the middle of the cruise, offering your children the chance to pose with their favorite characters, but this is also available during the Green Eggs and Ham Breakfast. ShowsThe Victoriana Show Lounge is the main theater spanning Decks 3 through 5. It’s host to Hasbro the Game Show, PlayList Productions variety shows, magicians, hypnotists, juggling and comedy performers, Seuss’ Story Time and bingo. Hasbro the Game Show is held twice (on sea days and in the late afternoon) during an eight-night sailing. Audience members (but only those at stage level on Deck 3 are chosen) enthusiastically answer trivia questions to obtain a spot as a contestant, acting out a rendition of a famous Hasbro game for a chance to win a Hasbro prizes — perfect for outgoing families. Freedom is the first ship in the fleet to receive all four new PlayList Production shows — 80s Pop to the Max, Island Getaway, Heart of Soul and 88 Keys — complete with changing LED backdrops. The singing and dancing among the eight cast members is enthusiastic, and if there’s a number you’re not a fan of, it’s over before you know it. With shows limited to 30 minutes, it’s possible to stand in the back to catch a show without tiring, and the short time span is meant to hold your attention, as well as offer more time to catch other events and activities onboard in a single evening. PlayList performances are playful, with costume changes, hi-tech scenery and all the popular hits reimagined. On an eight-night sailing, the shows rotate twice, and some performances are held twice in one night (around the seated dinner times). The gamut of trivia, towel-folding and ice-sculpting demonstrations, casino tournaments, raffles, karaoke and poolside contests is available around the ship, on any given day. During the day, the big-screen TV overlooking the pool in the Seaside Theater plays a live morning show hosted by your cruise director, news, live concerts and even episodes from shows such as “I Love Lucy” or “Everybody Loves Raymond.” Your typical seminars on beauty and weight loss, limited sales at the Fun Shops and art auctions are also held in the afternoon. Carnival maintains that shorter show lengths and multiple choices for entertainment each night allow passengers the opportunity for self-selection, attending as many things as they want in one evening. Dive-In movies are shown nightly in the Seaside Theater and offer families the opportunity to grab some food, cuddle up (or hop in the pool!) and watch a movie together. Slapstick comedies, straight-from-the-theater blockbusters and Disney’s newest releases are among the films featured cruises. Showings are at 6 and 9 p.m., featuring two different movies each night. The Punchliner Comedy Club, taking place in the International Lounge, features four comedians and each typically performs a family-friendly and adults-only set. Family-style comedy is showcased at 7 and 8:30 p.m.; the 18-and-over set is performed at 9:45 p.m. and again at 11:15 p.m. Your Fun Times will warn you that seats fill early, and they’re not kidding — get there at least 30 minutes prior to showtime for a good seat. The adult comedy didn’t hold back and was not for the squeamish — they warn you about that, too. Late-night karaoke is also held on select nights in the International Lounge. Themed parties on the Lido (White Hot or Caribbean, for example) provide an all-ages opportunity to dance under the stars or in the pool — why not? Expect dance music and groups of all ages. Freedom has three pools onboard: the Timeless, Endless (adults-only) and Stressless pools. All pools are saltwater and are refreshed daily. Timeless refers to the main Lido Deck pool on Deck 9. This is the hub of the action on the Lido Deck, with two whirlpools behind it on either side that attract teens (they are open until midnight). As you would expect, space fills up surrounding the pool, especially on sea days, but there is plenty of tiered seating if you don’t mind a stroll down to your dip. Expect music from the DJ’s beginning in the late afternoon, with plenty of group dancing and cannonball and hairy chest contests. Concerts from artists such as Bob Marley or Kenny Chesney are shown on the big screen in the late morning/early afternoon. Take Dive-In movies literally, and watch the evening selection while floating in the pool. The Stressless pool is much smaller and is located up one deck on Deck 10, beneath the waterslide. This pool also has two whirlpools on either side. A spiraling waterslide is one of the focal points of the outdoor decks. The entrance, on Deck 14, is typically lined with small children, but all ages are welcome to ride. There is no water park or kids’ pool on Freedom, so the slide is the main aquatic attraction for younger ones. Located near the slide entrance is a Ping-Pong table. Below, on Deck 12 aft, is the ship’s mini-golf course. Perfect for a quick round, the course is themed with stonework featuring ancient civilizations and strewn with replicas of Easter Island heads. Deck 11 is where the basketball and volleyball courts are located, though there is a skylight dome obstructing a good portion of the area. An oversized chess set extends over the Lido Deck, located in front of the Stressless pool on Deck 10. Formerly Camp Carnival, Camp Ocean is stepping in as the kids’ club replacement with an oceanography theme. Most notably, in place of one large, open floor plan, Camp Ocean is divided into separate, age-appropriate areas with activities catered to your child’s age group. Penguins are 2 to 5 (the only area with a gate, for security reasons), Stingrays are 6 to 8 and Sharks are 9 to 11. Accommodations can be made to group siblings close in age within the same area, but camp counselors say kids are happiest within their own age group. There are more than 200 ocean-themed activities scheduled during a single cruise in Camp Ocean, including arts and crafts sessions for the whole family. A Camp Ocean playground is sectioned off outside on Deck 12, and children enjoy outdoor playtime closer to sunset when the sun is not as harsh. A badge challenge — similar to Girl and Boy Scout badges — has also been introduced, encouraging young cruisers to earn badges in their passport for accomplishing a number of outlined, onboard experiences. There are more than 20 badges available for activities, such as singing karaoke, trying a new food in the dining room or creating a towel animal. Badges can be collected over multiple cruises, and at the end of each, there is a ceremony held with giveaways for each age group. Onboard cell phones are provided for parents of the youngest age group, but parents of children any age can call Camp Ocean and speak to their child at any time. Counselors will change diapers for children 42 months and younger. Camp Ocean is free of charge, but the Night Owls program (10 p.m. to 1 a.m) costs $6.75 per child, per hour, plus a 15 percent gratuity. Private babysitting is not available in-cabin. From 8 to 10 a.m. each morning, parents with infants are invited to use the Camp Ocean space. If they stay, this allotted time is free of charge; otherwise, the rate of $6.75 per hour, plus a 15 percent gratuity applies. On port days, care for infants begins 15 minutes before the first tour until noon, or from 1 to 5 p.m. for ships arriving in port after noon; the fee is the same. Circle C youth program is aimed at kids ages 12 to 14, while Club 02 is the spot for older teens (15 to 17) to socialize with other high-schoolers. In the midst of a specialty-dining trend, Freedom has maintained complimentary dining for most of its venues. 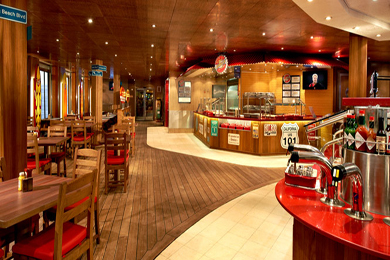 The addition of Guy’s Burger Joint and the BlueIguana Cantina to the Lido boosts this model and offers a variety from the standard buffet options, easily accessible on the Lido Deck. This saves the family a bundle, and keeps the kids happy with fast-food-style options like cheeseburgers, tacos and burritos. The main dining room is the nightly sit-down venue for families, included in the fare. There are two on Freedom: Posh and Chic. There’s no hulking chandelier or centerpiece, but overall, the space exudes casual elegance. Each night, just after your entrees are served, the crew performs a song-and-dance number, hosted by your maitre’d, and the kids seem to love this bit of dinner theater, clapping, dancing and singing along. A tableside performer can also be seen making the rounds on select nights, and crew always go out of their way to entertain tables with napkin animals or by sneaking extra desserts. The Posh dining room (Decks 3 and 4 aft) hosts the assigned dining times on sailings (6 p.m. for early dining and 8:15 p.m. for late). Service doesn’t end until around 10 p.m. for the late seating; we recommend eating at 6 p.m. The dinner menu offers various starters (always a hot and cold soup) and main dishes that rotate nightly, offering a variety of American fare with a few twists here and there. There’s always one rotating vegetarian entree, along with the set everyday menu (steak, Caesar salad, etc.) Plain chicken, pasta, hamburgers and anything a picky child might request can typically be accommodated. Special dietary requests can be met by alerting your maitre’d before or at the beginning of your cruise. Along with fish, steak and comfort food, the menu features one “didja (as in did you ever…)” menu item that invites dining guests to be adventurous and to taste off-the-beaten-path dishes, such as alligator fritters, frog legs and escargots. This could be perfect for a child looking to earn one of the program’s new badges — try something new at dinner. The After Dinner menu always features a cheese plate, three sherbets, four ice cream flavors, a tropical fruit plate and the ever-popular warm chocolate melting cake; three other options, including a “diet” dessert, are also featured. Specialty coffees, liqueurs and dessert wines are available for purchase, but coffee and hot chocolate are on the house. The Posh dining room is well-used, perhaps due to aft ocean views, and hosts sit-down breakfast, lunch, SeaDay Brunch and Tea Time, in addition to dinner. Breakfast (served 8 to 10 a.m., open seating) is basic, with eggs, French toast, fruit and cereal on the menu. SeaDay Brunch (8:30 a.m. to 1 p.m.) is a blend of breakfast and lunch options (and dessert), offered on sea days. Even if you don’t participate in the Seuss breakfast, steak and eggs and cereal-crusted French toast are offered here. Perhaps the star of the show for parents is the bloody Mary bar available tableside or walk-up, with any combination of base and garnishes. Lunch (open seating, noon to 1 p.m.) is a complete mish-mosh of items like sushi, Caribbean dishes, salad, spaghetti, fish, fajitas and a French baguette. A create-your-own burger option is also offered, with plenty of toppings, including guacamole, but we’d save the beef for Guy’s Burger Joint. Four desserts, ice cream and sherbet are offered for dessert. The little-known Tea Time is available from 3 to 4 p.m. on sea days on Deck 4 of Posh. There is no menu, but a full tea service with dessert cart is offered and is a lovely way to spend an hour of the afternoon, out of the sun. The Chic dining room (Decks 3 and 4 midship) is near-identical to Posh, serving the same menu items for dinner, but reserved on our sailing for Your Time Dining, available from 5:45 to 9:30 p.m. Chic also hosts the Seuss-inspired Green Eggs and Ham character breakfast, held on the final sea day of our sailing and available by reservation for $5 per person. If you have enough people at the table, try to order one of everything; it’s worth it just for the photos. Serving as the buffet option, the Freedom Restaurant sprawls across Deck 9 and offers nearly everything you would expect for breakfast and lunch, but shuts down most of its food service by 2:30 p.m. Floating blue Lady Liberty heads oversee everything, and a Statue of Liberty replica looks down upon the dessert station in the stairwell to Deck 10. Continental breakfast begins at 6:30 a.m. and the breakfast grill fires up at 7:30 a.m. Breakfast is available until noon for late risers. Tip: There is a made-to-order omelet counter inside, but for less of a line and more peaceful seating, try the omelet bar hidden out by the aft pool. For lunch and dinner, Chef Choice and Good Eats are the rotating options, with include items like cold salads, lasagna, chicken parm, casseroles, mashed potatoes and much more. Good Eats are available 6 to 9:30 p.m.
Swirls, the various soft-serve stations around Deck 9, are open 24 hours a day with ice cream and frozen yogurt. Apart from the chocolate and vanilla ice cream, strawberry frozen yogurt is in high demand. If you can’t get enough of potato hash, chicken tenders, fish croquettes, pork steak and the like, the Comfort Kitchen answers your cravings at a counter in the middle of the restaurant, offering a daily selection of foods that might remind you of variations on regional home cooking. Popular (always touting a long line), the Mongolian Grill provides you with a salad bar-style selection of Asian vegetables, seeds and noodles, which then gets thrown into a wok along with your choice of chicken, beef or calamari. Choose from a mild black bean sauce, a Thai barbeque with a little kick or a Szechuan sauce for spicing things up. Thai sauce is spicy so have your child test before eating here. Fish & Chips offers selections in small to tasting-size portions, so it’s doable to order everything on the menu and split between two people for a full lunch (if the kids like seafood or are interested in trying, the small portions are optimal). Ahi tuna with watermelon comes in a small cup and provides a refreshing palate cleanser. Other items on the menu include BBQ octopus salad, cider-battered fried fish filets (your standard fish and chips), fried oysters, bouillabaisse and fritters made from calamari, shrimp, zucchini and Maui onion. The standout, however, is the seafood ceviche — fresh and not fishy. Seating is also a bit quieter up on Deck 10. Hours are typically noon to 2:30 p.m., along with the rest of the Freedom Restaurant. Open 12 hours a day (11 a.m. to 11 p.m.), the deli is a gem for a quick bite. Cold selections include a turkey wrap, tuna on white bread, salmon on a bagel and a favorite: the arugula, pepper, tomato and mozzarella on a Ciabatta. Hot sandwiches are standard NYC deli fare: pastrami or corned beef on rye, a grilled Ruben, grilled ham and cheese, roast turkey breast, chili con carne and a hot dog. It wouldn’t be complete without coleslaw, pickles and a pleasantly crunchy sweet- and-sour veggie mix for sides, which line the shelves in jars behind the counter. The best time for pizza is anytime, so Pizza Pirate stays open all day and all night. Choose from margherita, funghi, pepperoni, quattro formaggi or prosciutto pies, all made with fresh Buffalo mozzarella — don’t let the names fool you — plain pies are available. Caesar salads are prepared to order. The style is thin-crust, so two slices are usually served to an order (maybe not what the family is used to at home with delivery). Not every pie is available at all times, so expect the occasional wait while the pizzas emerge from the oven and the line backs up. Though the ingredients seem fresh, our slice seemed to bend under the weight of the grease — not a problem in most kids’ books. What’s left to say about Guy’s that hasn’t already been said? With better customer satisfaction reviews than the for-fee steakhouse onboard, Guy’s burgers are hailed as delicious by an overwhelming majority, and the free aspect doesn’t hurt. Go tame with a simple patty, maybe some sauteed onions and mushrooms with special “donkey” sauce from the toppings counter, or go all out with one of the listed suggestions, which feature interesting options like a patty made entirely of bacon. Don’t forget about the satisfyingly seasoned fries — they constitute a meal themselves. BlueIguana also does breakfast — Mexican-style eggs, beans, salsa and hash browns (that’s what makes it) wrapped up and ready to order from 7:30 to 10:30 a.m.
Unpredictable but always fun to find, the small plates offered each evening from the Taste Bar give a glimpse into various dining venues onboard and also offer a great canap? to accompany a pre-dinner drink. Some samples are for the adventurous. Try a bite from the Sun King before making a reservation, or get a taste for the flavors at BlueIguana with a chicken, avocado and lime tortilla soup, accompanied by roast pork, green chili salsa and aged Cotija cheese. Hours vary, but Taste is only available in the evening. A latte or iced coffee throughout the day has become a modern necessity, and the Viennese Cafe answers the call with gusto. A full beverage menu (which also features alcoholic coffees if it’s already been a long day) is accompanied by a bake case with tempting fruit tortes, chocolate parfaits, cookies and carrot cake, among the offerings. Flavored hot chocolates are a treat for kids. Parents: Try an off-the-menu coconut cappuccino (with tip, it will run you about $5). Sweets are $2 to $3, depending if it’s a slice of cake or something else. Specialty coffees are also served up at the Millennium Bar in the lobby on Deck 3, and on Deck 9 at a counter in the restaurant. The line’s candy and gift shop, Cherry on Top, offers bulk candy options and oversized lollipops, gummy funnels and jawbreakers for anyone deserving of an extra treat. Champagne, greeting cards and roses are also available for more grown-up celebrations and occasions. Open until 11:30 p.m. each night, this makes a great pit-stop before a Dive-In movie at the Seaside Theater (just be aware it’s weighed by the pound so keep an eye out for heavy-handed scooping). When all else fails, room service comes to the rescue, 24 hours a day and free of charge (save a small cash tip to the delivery personnel, which is optional, but appreciated). Hot and cold sandwiches, not unlike those offered at Carnival Deli, come with potato salad, coleslaw, potato chips or pretzels, and you have the choice of white, whole wheat or rye bread. Mixed greens, Caesar salad and veggie sticks with dip are also available. Desserts include cookies, chocolate cake, fresh fruit salad, strawberry yogurt and New York cheesecake. Available beverages include juice, milk, coffee and tea, but not water. Soda and a limited selection of beer are available at bar prices. Kids-only dining is available free of charge, most nights, through Camp Ocean. Held from about 6 to 6:50 p.m. (food served until 6:20 p.m.) on Deck 10 near Fish & Chips, meals feature items like quesadillas, pizza and fish fingers with broccoli, carrots, white rice, apple slices and sugar cookies. Out on the Lido, there’s no reason the kids can’t partake in a tropical frozen concoction along with you — nonalcoholic fruity slushes are a hit from either the RedFrog Rum Bar or BlueIgunana Tequila Bar. A Bottomless Bubbles soda card may be a worthy investment if soda pop is a priority — $4.50 per child, per day plus a 15 percent gratuity (adults run $6). Otherwise you’re drinking iced tea, lemonade, fruit juice concentrates or water. The Green Eggs and Ham character breakfast was held on the last sea day of our cruise with two seating times (the latter began check-in at 9:45a.m.). Reservations are required, and the breakfast can be booked by dialing 32323 from any ship telephone. The cost is $5 per person, which we consider a great value. 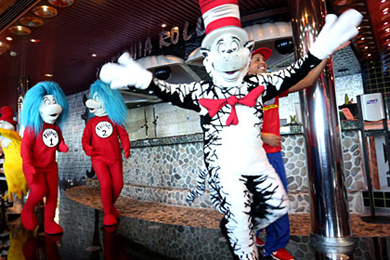 Held in the Chic dining room on Deck 3, the space is completely transformed into a Cat in the Hat theme. All characters make appearances, but they stand in the middle for photo opportunities rather than visit each table. Menu items leap from the pages of Dr. Seuss’ books and feature, of course, green eggs and ham (served atop an English muffin with a red velvet French macaroon on the side). Other options are Truffula Tree pancakes (seven of them, though mini), Horton’s cereal-crusted French toast (a real sugar rush when coated in Fruit Loops) and waffles with blue- and orange-colored nooks. There’s even parfaits for dessert (yes, breakfast with dessert). Apple and orange juice is traded in for moose juice and goose juice, and coffee (which we were secretly told was not originally on the menu) has luckily found its way back in time for parents who need their own magic pick-me-up. Not many dining options onboard require a charge to your Sail & Sign account, and these are generally adults-only experiences if parents can get a night to themselves. Sun King, the onboard steakhouse, offers the opportunity for an upscale evening away from the masses, and Chef’s Table is a supremely special occasion with the intimate chance to meet the chef and tour the galley. The Chef’s Table experience takes place once per cruise in nontraditional dining venues like the galley or library. The night includes a galley tour, led by the ship’s executive chef, a private cocktail reception and a multicourse dinner. Inspired by the opulence of Louis XIV, Sun King is the steakhouse onboard Freedom. The cover charge includes a choice of starter, salad, entree with side dishes and dessert. Although the restaurant touts an extensive wine list, alcohol is additional. Tucked away on Deck 10, Sun King offers an intimate night out away from the routine of the main dining room, and the restaurant never seemed fully booked. Meals take about two hours, but not from inattentive service; course after course is leisurely presented with poise and panache. A presentation of the cuts of meat is made prior to ordering, and if you have any questions about the menu, that’s the time to decide between a cowboy steak and a rib eye. Eight starters include escargots (buttery and delicious in puff pastry), tuna tartare, lobster bisque, onion soup and a flavorful grilled Portobello mushroom. Salads are Caesar, baby leaf spinach, iceberg or sun-ripened beefsteak tomato (better quality than you find in the MDR). Choose from a cut of steak or lobster, surf and turf, rosemary chicken, grilled lamb chops, lobster ravioli or the fish of the day. Available sauces are three peppercorn, wild mushroom and bearnaise. Desserts include a cheese plate, ice cream and sherbet selection, and fruit, but feature caramelized apples, a chocolate sampler and a cheesecake that is so large, waiters playfully joke that you can’t leave until you finish the entire thing. Carnival recommends tipping $11.50 per person, per day, which is split among the staff. The amount is automatically charged to your shipboard account, but it can be adjusted at the guest services desk. A 15 percent gratuity is automatically added to bar and spa bills. The room service staff appreciates receiving a couple dollars in cash for delivery, though it is not required. Freedom sails Caribbean itineraries, and the daytime dress onboard reflects that with a casual, poolside atmosphere. Cover-ups, shirts and flip-flops are required for the indoor Freedom Restaurant on the Lido Deck, but the rule doesn’t seem to be strictly enforced. The main dining room requires that men wear shirts with sleeves, and at night, wardrobes are typically turned up a notch to include khakis and polo or button-down shirts for men, and blouses or sundresses for women. Depending on the length of the itinerary, the ship hosts one to two formal or “cruise elegant” nights per sailing. Fashion runs the spectrum from cocktail dresses and pressed slacks to full evening gowns and tuxedos; pack according to your comfort level, but be aware it does get dressy — this goes for all the pint-sized people, too. The drinking age on all cruises is 21 for all alcoholic beverages. Bringing liquor onboard at embarkation is not allowed. All liquor and beer brought onboard will be confiscated and stored until the end of the voyage. The confiscated drinks will be available for collection from a designated onboard location at the end of the cruise. Unsealed liquors will be discarded without compensation. Bringing wine or champagne onboard is allowed during embarkation only, and passengers may bring one bottle of wine or champagne (750ml) onboard. Corkage fees are $10 in the dining room and $14 in the steakhouses. Purchased liquor in port or in the ship’s duty-free shop will be retained until the last night of the cruise. 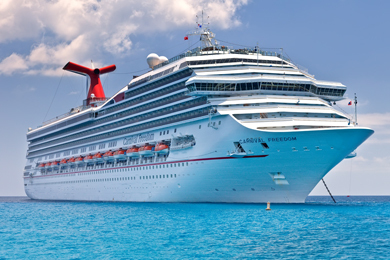 Carnival guests are allowed to bring two bags on the ship, as well as a carry-on. It’s suggested that the bags remain below 50 pounds. Don’t forget to pack seasickness medicine. You might not need to use it, but it’s good to have just in case. Ginger candies also help to calm an upset stomach. Additionally, we suggest packing extra hangers for clothing. The ship provides 10 or so. Sunscreen is expensive onboard and in port, so don’t forget it; we recommend a liquid, rather than a spray, at a high SPF for fun under the Caribbean sun. A money-making standby for any major cruise line, silly cruise photos and cruise portraits are a tradition. Be prepared to get your picture taken several times before you board the ship, leave for excursions, at dinner and when you disembark from the cruise. You certainly don’t have to buy them (though they make for a nice souvenir). Photographers camp out each evening on Deck 5, or the Promenade Deck, with various backdrops for cruise portraits (it doesn’t cost anything to pose, just to buy) so it can get a bit congested at night, but the couches along the windows make for great people-watching, especially on formal nights. On Deck 4, you’ll find Pixels Photo Gallery and Dream Studio. As your cruise progresses, portraits will increasingly fill the walls in hopes of being purchased. The Babylon Casino sprawls across a sizeable portion of Deck 5 and offers rows and rows of glittering slot machines for every niche, and plenty of card tables with a great variety. There is a lively crowd at the casino at any given time. The 70s Night Club on Deck 5 is the after-hours spot to shake your groove thing, and our guess is the disco theme attempts to appeal to the older set, while a wild blend of dance music draws in anyone looking for a bass line. Michael Jackson is a popular theme along with the 80’s. There are plenty of places to blend into the dark, though, if you’re looking for a little club atmosphere without being smack in the middle of the dance floor. You must be 18 to enter. The Endless or aft pool is an adults-only retreat on Deck 9 aft, reserved for the 18-and-older crowd. Seats surrounding the pool fill up after the first day, but plenty of seating is available a quick walk up to Deck 10. Two adults-only whirlpools (an alternative for those 18 to 20) are located behind the pool. This pool is protected by a magrodome in the event of bad weather, so you can keep on swimmin’. A full bar, as well as a handy coffee and tea station, are within close reach. For a true adult escape, Serenity is Carnival’s 21-and-over sun deck located on Decks 12 and 14. Steps away from the Lido, it is surprising how dialed-down the noise is upon entering, and most people maintain that atmosphere. Many find it odd that Serenity wraps around the Camp Ocean kids’ club on the same deck, but we don’t find the location to be noisy or disrupted by activities. The playground on Deck 12 is only in use in the evening, once the sun has eased up, allowing the kids some outdoor playtime. Up on Deck 14 are two sizeable adults-only whirlpools. Nearby there are showers and padded hammocks for post-soak relaxation.